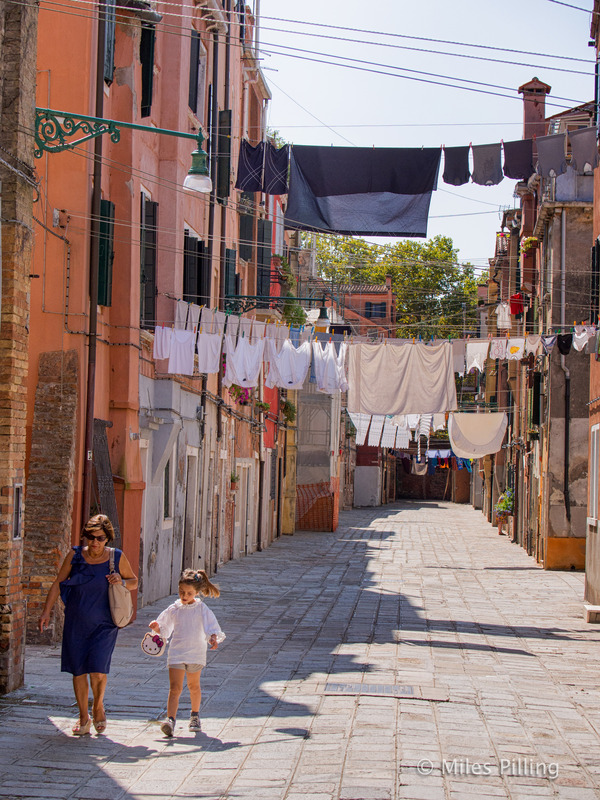 A friend recently told me, with a bit of sadness, that she found the streets of Venice were not garlanded with colourful washing anymore. 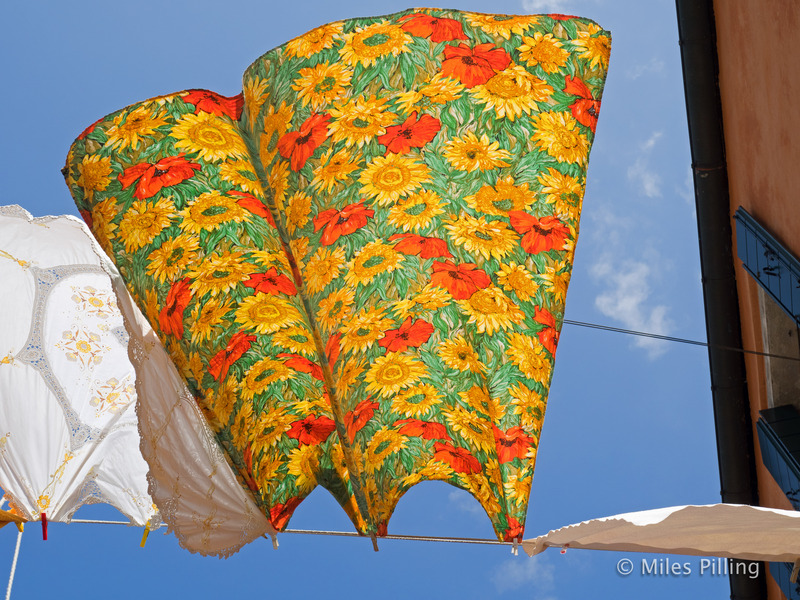 I may have been lucky, but just a few water bus stops away from the main tourist spots we found areas where the washing lines were works of art. I spent a very enjoyable hour in one street taking most of these photographs and just watching life pass by. 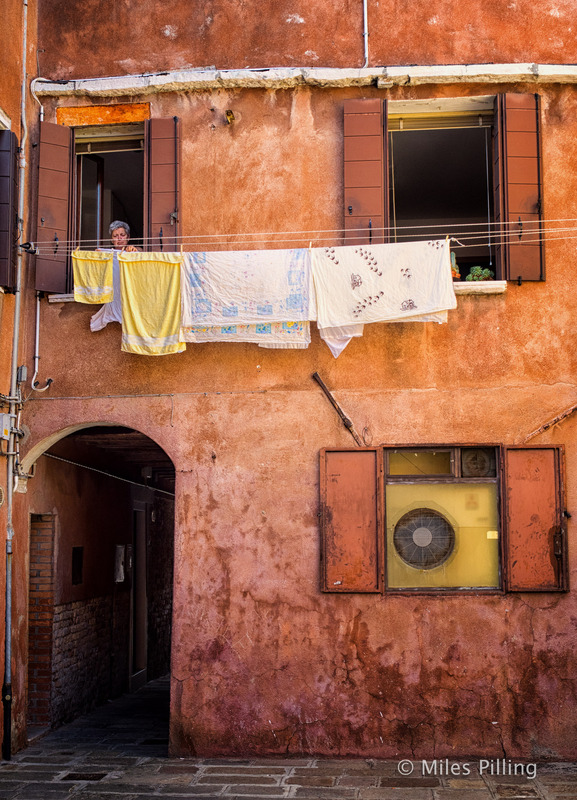 If you are a people watcher, Italy is a paradise. 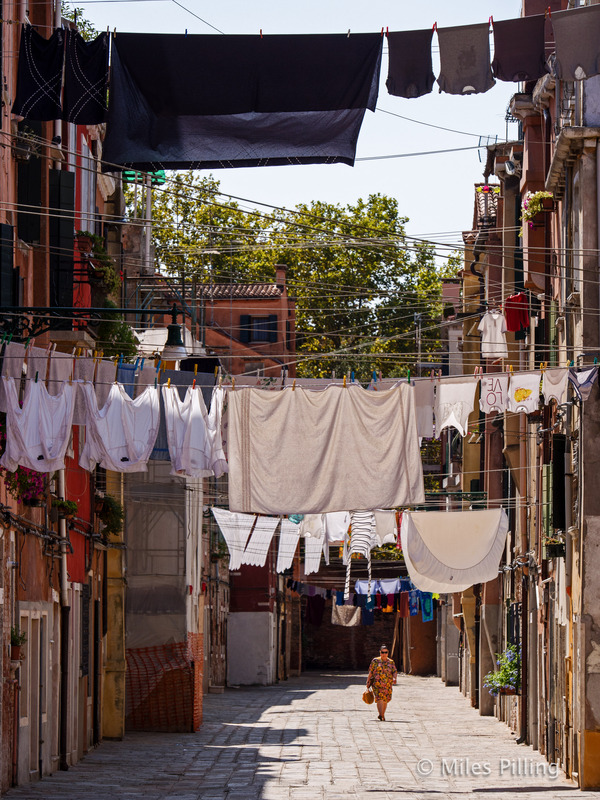 Away from long stretched out streets, in small squares you can find locals air-drying their laundry too. This lady gave me a nice smile and thanked me in Italian after she dropped a peg and I threw it back to her. 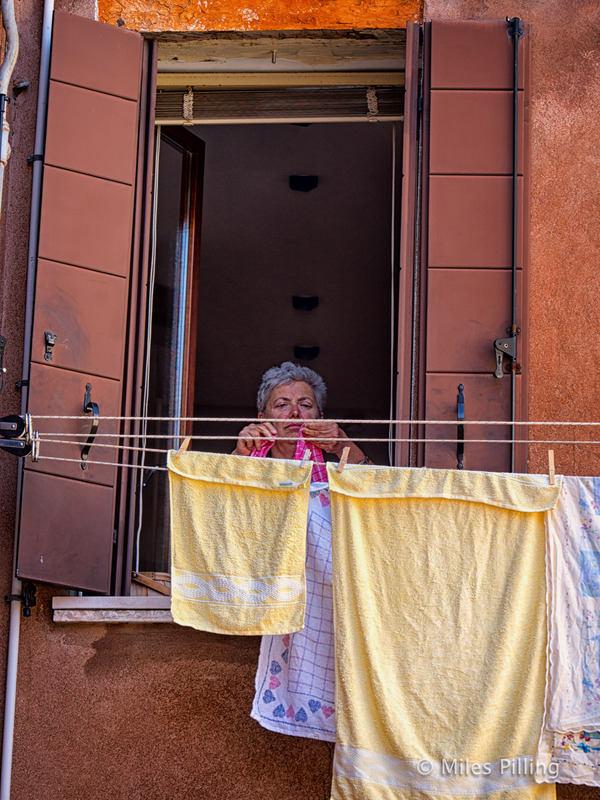 She seemed quite resigned to tourists taking snap shots as she took part in what, to her, is obviously the unremarkable activity of hanging out the washing! 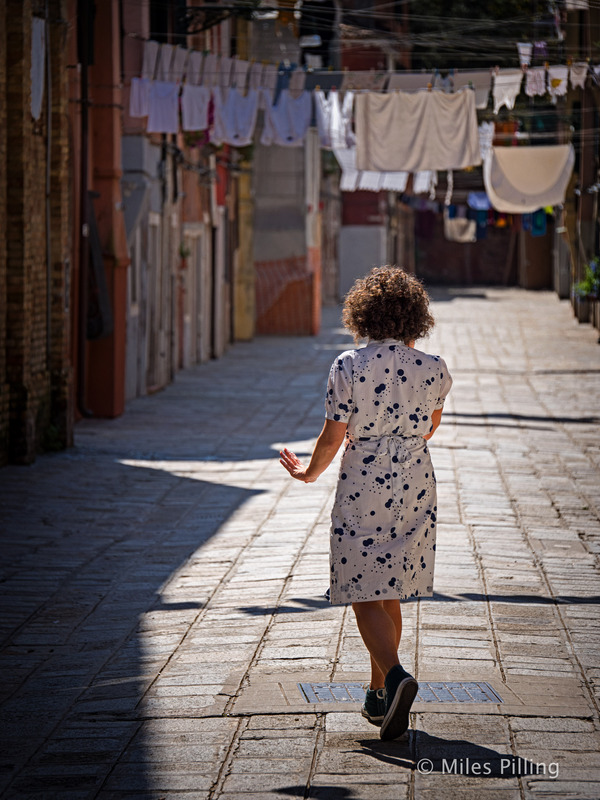 One final image from the first street: The hour I spent there is now one of my happiest memories of Venice. These pictures were taken with either an Olympus OMD EM1 with their new(ish) 12-40mm f2.8 lens or an OMD EM5 with Panasonic 35-100mm f2.8 OIS. I’ve found that, even though I walk using crutches (see the about page for more on this), with the EM1 on a Black rapid strap at my side and the EM5 around my neck, I can keep both with me all day when I am travelling and never have to change lenses. It’s a fantastic lightweight, mirrorless travel camera kit with no risk of exposing the sensors to dust – or canal water! I hope they create a few smiles in what’s been a very depressing few days for the world.